The Kensington Keyboard for Life Desktop Set includes a full-size, spill-proof keyboard and an optical mouse. The mouse features an optical sensor and three buttons with a scroll wheel. Its shape is contoured for comfort and it works in either your right or left hand. 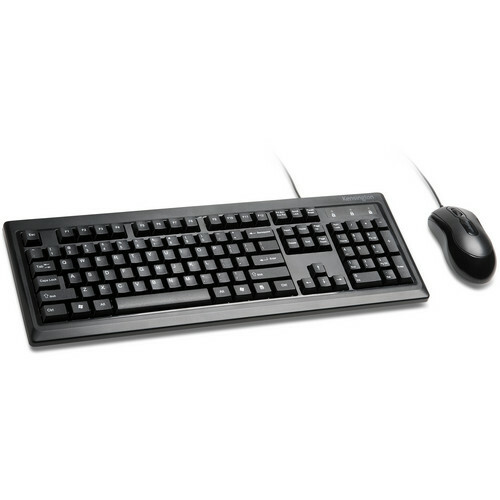 The desktop set is compatible with Windows and Mac and features easy plug-and-play operation. Box Dimensions (LxWxH) 18.4 x 7.9 x 2.7"
Keyboard for Life Desktop Set is rated 4.7 out of 5 by 3. Rated 5 out of 5 by Denault from Like an old manual typewriter Noise and feel/touch on this model are like an old typewriter. I haven't done any detail/drawing with the mouse, but for regular use, the mouse seems quite precise, doesn't skip, nice scroll. Always a fan of the extended keyboard, better ergonomics compared with the laptop keypad and no more batteries using the wireless keyboard on my desk top. I would buy this product again but am hoping it is literally a keyboard for life, and I recommend purchasing from B & H. The item shipped quickly and was carefully packaged, . Do the function keys of the Kensington keyboard work like an iMac wired keyboard? Any drivers needed? Any setup? They don't do the same functions key for key, but they can be customized through your Settings once you have it plugged in. No driver needed. First time you plug it in it will ask you to type a few things so the computer can re-orient itself but I've used it on multiple iMacs and Macbooks without a problem.